The original Pudleston Court was described in 1824 as an excellent house, fit for the residence of a genteel family, with double coach house and stables and much farmland and situated close to the turnpike road from Worcester to Leominster. In good repair, the ground floor had an entrance hall; breakfast, dining and drawing rooms; Butler’s pantry; kitchen; back kitchen and water closet. The second floor had five large bedrooms with four dressing rooms, and in the attics were six more bedrooms and a dressing room. There were good cellars, a dairy and other offices. In the garden there was a gardener’s house and a large hot house within a walled surround. The house was advertised for rent in 1824, and again in 1825 and I have not ascertained whether it was indeed let – but shortly afterwards Pudleston House was bought by the Rev. John Wood Duppa who remained there until his death in 1840 at the age of 79, when the estate was put up for sale. There was a separate auction for his collection of valuable books, amounting to over one thousand, mostly on the subject of Divinity, and also one for his herd of pedigree cattle. He had been an active magistrate for Herefordshire, and was Rector of Pudleston and Perpetual Curate of Hatfield. His wife Jane died in 1836 aged 77 being described as a lady of most exemplary piety and benevolence. In 1845 Pudleston Court was again up for sale, and was bought by Elias Chadwick born 1813 in Lancashire. As was the fashion at the time, Elias Chadwick determined to display his wealth and importance via the medium of bricks and mortar and decided to completely rebuild Pudleston Court. He employed J.T. Brearley, an architect from Liverpool and the end result was indeed a most impressive mansion with castle overtones. Elias Chadwick was known for his generous nature, as an example, in 1847 he distributed warm blanks to the poor of the parish during a harsh winter. He was also President of the Tenbury Wells Horticultural and Floral Society as well as J.P. and Deputy Lieutenant, and Director of the Leominster and Kington Railway company where he held shares. He was also a director of the Shrewsbury and Hereford Railway. In fact there were few important pies in Herefordshire that he did not have a very large finger in. In 1854 he was High Sheriff of Herefordshire and frequently gave lavish dinners at Pudleston Court. 1861 saw him initiated into the mysteries of the Ancient Order of Foresters when he was made an honorary member – he duly showed his appreciation by presenting them with a very handsome donation to augment the funds. In this same year, Elias and his butler were involved in a train crash on the Worcester line – Elias suffered severe injuries to his leg, but the butler escaped with shock. Again in 1861, the Mayor, Aldermen, Town Council, the Vicar and 60 other people of Leominster made public an invitation to Elias Chadwick; they were wishing to show their admiration and thanks for his many acts of munificence towards the institutions of Leominster, and his general kindless and courtesy, and thus invited him to join them at a Dinner at the Oak Hotel in Leominster. Elias was asked to choose the day, and the dinner was then scheduled for 5th February 1862, with tickets going on sale for 10s 6d. This did include a bottle of wine and a dessert! Elias Chadwick was an active Freemason and attained at least the rank of Junior Warden. Elias Chadwick continued his generous ways, and each winter he gave large amounts of coal to the poor of the parish and to the school – he does truly appear to have been a greatly loved and admired man throughout Herefordshire. Then came the bombshell accusation. In 1865 Elias Chadwick, aged 52 at that time, was charged along with a Butler by the name of Henry Merton, “ with committing an unnatural offence of the gravest description. “ The penalty for which only recently had been death. The case for the prosecution was totally reliant on the evidence of one witness, which turned out to be uncorroborated. Also character witnesses for Elias came forward to say that it was unthinkable that such a kind and well loved as well as moral man could carry out such an act. There were similar character witnesses for Henry Merton, and eventually the Magistrates declared that there was insufficient evidence, and the men were released. It is of course possible that Elias and Henry did have a thing going on, and these days there would be no case to answer for; so was it someone with a grudge who reported seeing them together in the graveyard that night when in fact it was a lie, or was Elias a latent homosexual who succumbed to his feelings when his wife was ailing? We will never know! Certainly, the endless articles and references to Elias prior to this date spoke glowingly of his generosity and kindness as well as his supremely likeable character – all qualities that I have seen in gay men that I have met and come to know. However, the matter did not appear to end there as in 1868 a man named Paris Francis White was charged at Leominster Magistrates Court with an attempt to blackmail Elias Chadwick. Paris wrote letters to Elias, demanding money with threats about exposing details of his personal life which he would wish to conceal. 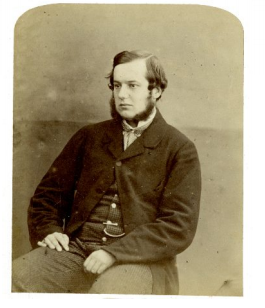 I can find no more articles relating to Elias Chadwick after 1868, and in 1875, he died at Pudleston Court. The Rev Anthony Benn, the son of Captain Benn R.N. of Cumberland, was rector at Woofhardisworthy in Devon from 1866 until 1872. He married Elizabeth Mansell, and they moved to Pudleston Court where he was lord of the manor and patron of Pudleston. In 1873 his marriage fell apart when he discovered his wife’s fondness for other men, and he went to Court for the dissolution of his marriage – accusing Elizabeth of adultery with Lieutenant Uvedale Okeden of the 10th Hussars and also with a Francis Whitson. Elizabeth then filed a cross petition, charging her husband with many acts of cruelty during their time in Woofardisworthy and asked for a judicial separation; but by a subsequent order of the court she amended her petition and added a charge of adultery by The Rev Anthony Benn with a Mrs. Eliza Whitley in Brompton in May 1871. The proceedings were put on hold in the hope that a settlement out of court could be agreed. A decree nisi was eventually obtained and the decree was made absolute in 1874. Perhaps this was a case of six of one and half a dozen of another. The Rev. Anthony Benn died at Pudleston Court in 1904, having bequeathed Pudleston to one of his sons, Charles Anthony – Barrister at law – who also inherited much of his wealth. Another son, Herbert Robert was left the property in Devon. He was buried at Pudleston Church. Anthony Benn’s son Herbert Robert Benn settled in New Zealand at Lake Okareka near Rotorua, but stayed in contact with his family. A person in New Zealand who is researching his life is interested to know whether there are any Benn or Maunsell descendents / relatives who know of any family stories, photographs etc. from this time. This person has stories and photographs which relate to Herbert Benn’s life in New Zealand. If you have interests in this family, please contact me here, and I will forward your details. 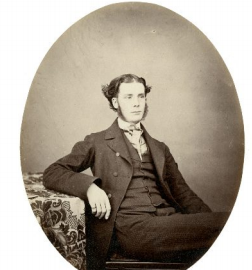 Charles Anthony Benn was a student at Trinity Hall College, Cambridge, reading Geology. He was something of an athlete, gaining successes in middle and long distance running, and was also something of an expert in growing nectarines! Charles Anthony Benn lived at Pudleston Court briefly, but then put the house on the market in March 1905, along with most of the furniture and valuables which included bedroom suites; beds and bedding; cheffoniers; cabinets; carved oak bookcases and hall furniture; billiard table by Thurston; unique Elizabethan, Jacobean and other silver; guns, phaeton; dog cart; brown mare and many agricultural items. (I do hope that the brown mare went to a kind home – with such a sparse description I worry!). He donated some of the items however to local causes, including the Hereford Public Library and Museum, who received a large geological collection – birds’ eggs, eight cases of stuffed birds and fifty volumes for the library lending department. Charles also gave them £10 towards the cost of a proper cabinet for the geological specimens. Charles also bequeathed property and land to Trinity Hall College and the sale of these funded a bursary. Herbert Robert Benn was born 25th September 1869, and was educated at Kingsley College; Ramsgate College and Sherborne School. Originally keen to take Holy Orders, Herbert decided instead to attend the Downton Agricultural College in Wiltshire. By 1909 George Ernest Wright was in residence and he was still there in 1911, but then during the second World War, the house was taken over by the Red Cross who used it as a convalescent home for injured members of the armed forces. It was next turned into special school. Albert Heinj was born in 1927 in the Netherlands, grandson of the founder of a huge supermarket chain, and he purchased Pudleston Court in the late 20th century for himself and his wife, Monique. He completely restored Pudleston Court, which by this time was somewhat run down and then turned his attention to neglected and shabby parts of Hereford, turning what was near wasteland by the river Wye into the smart and popular Left Bank. and became an important benefactor for Hereford Cathedral. In 1944 Albert was struck down with polio and eventually became confined to a wheelchair. In the end, he was unable to leave his bed and he died in 2011. Two years after Albert’s death, the Court was up for sale again, but now it had 20 bedrooms, 6 bathrooms, electricity and central heating. Pudleston Court is still privately owned.